Several years ago I wanted to tackle the toxins in our lives and make serious changes to start to eliminate them from our lives. There has been a lot of trial and error over the years, starting with buying green products and ending with us making as many of our own products as we can. 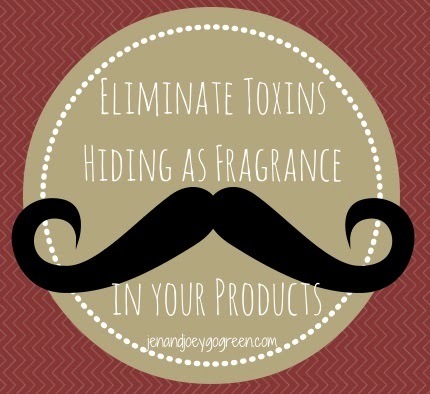 By far the easiest way to cut toxins from your life is to eliminate chemical fragrances. Fragrance hides behind proprietary laws in plain sight on our labels. You know it is there but because of these laws we do not know exactly what is in the product to make up the "fragrance". In fact, 3,163 toxic chemicals can hide behind the fragrance label in our products. These ingredients assault our senses and adversely affects our health. When I started to look at eliminated fragrance from our lives I started by making a list of those products that omit a smell that most people associate with "clean". This list is a great place for any family to start to reduce the amount of toxins they are exposed to. Once you make a dent in eliminate fragrance from your life you will be amazed at how sensitive you become to these toxic chemicals. I can smell traditional laundry soap a mile away. Tide, Sunlight, Cheer, they all smell the same. Fake lemons and toxic ingredients. Add fabric softener and dryer sheets and you have a recipe for a lifetime of health problems. Eliminating fragrance from your laundry products will have a lasting positive impact on your health throughout the entire day. You wear clothes that are covered in a layer of chemicals and sleep in a bed that has this same layer. Finding a natural laundry soap that works for you with your washing machine and type of water may take some time, personally I am on my 3rd soap and have liked them all but am loving my Soap Nuts. White vinegar is a natural replacement for fabric softener and wool dryer balls will instantly replace the chemical laden dryer sheets. I have 5 in our dryer and add a few drops of lemon essential oil to one of the balls once a week. Have you ever noticed that with some soaps you can smell them on someone hours later? You know that can't be natural! Switching soaps to one with natural fragrance was super easy for me. I stopped using body wash from places like the Body Shop which are full of very strong chemical fragrances and started to use Dr. Bronners bar soaps. For hand soap I opted to make my own following my friend Jenny's recipe. Traditional cleaners are packed with chemical fragrance, often trying to mimic something from natural. Like sunflowers or pine trees or fruit. Don't fall for it! These scents are not what they are pretending to be but you can use natural product to achieve the same results if you like to have scent in your cleaners. Make your own simple cleaner that will work for all surfaces. Leave it fragrance free or add your favourite essential oil. I don't know why people use air freshener because it just temporarily masks odours by covering them with chemicals that are stronger than the original odour. Use this recipe to make a natural alternative that is free from harmful fragrance. There is nothing worse that creating a fragrance free environment at home and then going into work and being bombarded with a nose full of a million different types of perfume. Reach out to your employer and ask them to consider instituting a Scent Free Policy in the workplace. It is a great way to further reduce your exposure to fragrances and create a safe environment for those with allergies. How have you eliminated fragrance from your life? Looking for Tips on Reducing Your Exposure to Toxins? The Green Sisterhood is hosting an Earth Day Blog Carnival and this weeks focus is Toxins. Great articles below! Leigh from Green4U - Toxic Chemicals: Aren't We Protected? Are You Using Your Steam Cleaner Properly? I found this through Pinterest! What a fantastic post. My husband received a Mild Traumatic Brain Injury about 2 1/2 years ago and has had a host of problems including becoming incredibly scent-sensitive (especially to artificial fragrances) since his injury. This has prompted me to eliminate non-natural fragrances, and even some natural ones at times, from our lives. It's definitely an ongoing process! I have found it useful to make my own products as well. This is such a good resource. I have terrible allergies to anything scented, and sometimes it's hard to figure out whether a product actually has it or not. I guess I'm lucky in that I've ALWAYS been allergic to fragrances, even pricy perfumes. I'd get headaches and nausea anytime Mom wore her favorite, so I never use scents at home that aren't natural, like essential oils. Thinking back to when I was younger I think about how strong some of the fragrances were that I was wearing. Like Elizabeth Arden Sunflowers. Fragrance is everywhere! It's incredible how difficult it is for me to try to remove (or even just reduce) the fragrance in cousins' hand-me-down clothes. My husband's and my noses are so much more sensitive now that we've eliminated all the synthetic fragrances from our home.